Malibu. It was tops out of 105 cities of its size across the state (and based on vehicle miles traveled). I was a admittedly a bit surprised, but upon further reflection there’s little surprise. It’s not hard to puzzle out the reasons: Speed, booze, and distraction. The Pacific Coast Highway runs right through residential and often crowded areas; although the speed is marked for an already high 45 mph, as the road is engineered to highway standards there’s little immediate incentive for drivers to slow (watch here to see the speed limit compliance patterns of California drivers in action). Then there’s the alcohol factor — people coming off the beaches are often more than a little liquored up (and let’s not forget that Mel Gibson, who told police he ‘owns Malibu,’ was busted for drunk driving after a night at Moonshadows; the fact that Gibson could have killed someone got rather overshadowed in the hue and cry over his drunken rantings to the cops). Comments Off on The Most Dangerous Place to Drive in California. Click here to leave a comment. In the sort of urban future envisioned by Buckminster Fuller and others, urban traffic congestion would be conquered by personal flying cars, which could use all that empty vertical space to avoid gridlock. There’s something of that spirit found in contemporary Brazil. 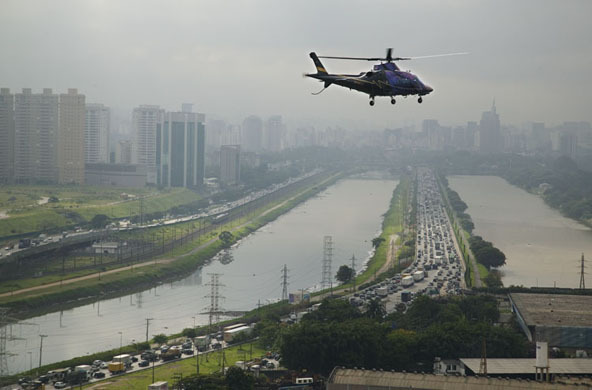 Sao Paolo, which has legendary traffic, also has some of the highest helicopter traffic rates in the world, as Tom Phillips reports in this Guardian podcast. Wealthy Paulistas, it seems, eschew the city’s cluttered roads, whisking from helipad to helipad, turning two hour slogs into 17-minute jaunts. I couldn’t help notice one strange detail, lurking in the captions accompanying the wonderful photographs by Eduardo Martino. One of the frequent destinations of helicopters, it seems, is a place called “Alphaville.” It’s a luxury exurb, begun in the 1970s, that seems something of a piece with J.G. Ballard’s Super-Cannes. I know that real estate naming schemes are often risibly pompous or woefully inaccurate, but there’s something astoundingly perverse in naming a city that shares its namesake with the dystopian metropolis of Jean-Luc Godard’s 1965 film, a place where emotion is banned and absolute conformity assured. Then again, the motto of Alphaville in the film is “Silence – Logic -Safety – Prudence,” (these are not necessarily overabundant qualities in Sao Paolo) so maybe the developers were sticking closer to Godard’s vision than we know. I’m just not so sure about that “silence” bit with all the helicopter traffic. Comments Off on Air Traffic. Click here to leave a comment.